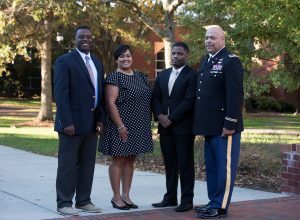 L-R, Marcus Elliott, Zaire Miller McCoy ’02, David Williams Jr. ’13, and Retired Col. Berkley Gore ’85. The Elon Black Alumni Network Awards recognize black alumni who have distinguished themselves in a profession and/or local community and brought honor to Elon through their support of EBAN events, initiatives and the EBAN Scholarship. The awards are presented annually at Homecoming during the EBAN Awards Brunch. Outstanding Service to Students Award: Presented to a current Elon Faculty or Staff member who has made significant contributions to the Elon black student experience through mentorship, support and interaction with students. K. Wilhelmina Boyd Outstanding Service to the Students Award: Randolph “Randy” Williams, Jr.